2012 Audi Q5 unveiled | What Car? This is the 2012 Audi Q5. It has a range of updates, including cleaner, more powerful engines and cosmetic tweaks. Visual changes for the 2012 Audi Q5 are subtle. There are redesigned bumpers, which include high-gloss black inserts for the front air intakes and a new-look rear diffuser. A new front grille with bevelled corners brings the Q5 into line with Audis latest models. There are new headlight lenses, while the optional xenon plus headlights include LED daytime running lights and add new LED rear lights. Four new exterior colours are available. Inside, the 2012 Q5 has a new instrument display, steering column stalks and extra gloss-black and chrome trim. Three new interior colourschemes have been added and the 2012 Q5 gets Audis latest entertainment systems and options. Four new - or updated - engines will be available from launch. A new 2.0 TSI petrol develops 222bhp 14bhp more than the engine it replaces. Average fuel economy is 2.3mpg better at 34.9mpg. A supercharged 3.0 TFSI V6 engine replaces the previous naturally aspirated 3.2. It develops 268bhp a 2bhp increase yet average fuel economy is improved by 2.8mpg at 33.2mpg. A new 175bhp 2.0 TDI diesel engine replaces the previous 168bhp version. Average fuel economy is 1.5mpg better, at 47.1mpg. The latest 3.0 TDI V6 diesel engine has 242bhp, 4bhp more than the 3.0 TDI model it replaces. Average fuel economy is 44.1mpg, a 6.5mpg improvement. A stop-start system and four-wheel drive are standard on every Q5. The four-cylinder models have a six-speed manual gearbox as standard; an eight-speed auto box is standard for the 3.0 TFSI and optional for the 2.0 TFSI. Audis seven-speed S tronic double-clutch transmission is standard for the 3.0 TDI and an option for the 2.0 TDI. The suspension has been tweaked to improve ride comfort, while theres a new electromechanical power steering system. 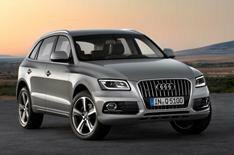 The 2012 Audi Q5 is due on sale this summer, with first deliveries in October. Prices and specifications are yet to be confirmed, but wed expect a small rise, so the starting price is likely to be around 33,400. A lower-powered diesel model is expected to join the range later in 2012, dropping the entry price closer to 31,000.